You have to imagine Puglia, the 'heel of the boot,' the part of southern Italy that juts into the Mediterranean Sea. There is the region of the Salento, where agricultural workers have done, and continue to do, their damnedest to make the soil bloom with produce. The trees in the olive groves stand with their thick trunks, and wind and writhe over the ages. Past the fields lies the city of Lecce, capital of the Lecce province, over two millennia in the making and studded with baroque architecture and a caramel color stone that renders the streets creamy in the soft light of evening. The south of Italy has a long history of joy and sadness; riven with poverty, many inhabitants have moved away. As with much of Italy, the influence of the Catholic Church is felt here, hot under the sun; but, there is a persistent pulse of heathenism and rhythm that runs underfoot. Puglia is the land of the taranta, the spider, which bit women (and some men) for thousands of years, causing distressed families to buy the service of musicians so that the afflicted could dance their poisoning away. The Church conflated the spider with Saint Paul, entwining in folk song a sacred/secular eroticism that feels like magic. The cultural anthropologist Ernesto De Martino caught the end of the traditional phenomenon of tarantism in the late 1950s, early 1960s, documenting this particular social-psychological cultural complex in his 1961 book "The Land Of Remorse." Beginning in the 1970s, southern Italians began to rediscover this ancient folk music, whose percussive qualities and extensive use of tambourines to induce trance could be traced back to ancient Greek Dionysian rites. At first, the music was difficult for southern Italians to listen to; this was a stigmatic musical form that opened up the wounds of poverty and its deleterious effects upon families. But in the 1980s, young Salentinians rediscovered their roots  the urban existence that many of their parents had sought had caused a great longing for the past of their ancestors. And so the tamburello beat again, an aural statement of cultural reclamation. Where the pizzica tarantata had been a music used to strike a chord of individual therapy primarily amongst women in a highly patriarchal society, now the music was reconstituted on the concert stage as a kind of group exorcism for dancers. Whether beset by the ills of modern society, or attuned to crowds seeking to lose themselves in the pizzica's hypnotic beats, the music of the spider was resuscitated to speak to contemporary hungers. Both albums reviewed here, by the Canzoniere Grecanico Salentino and the duo Hasa-Mazzotta, build upon past traditions and send them spiraling down different roads. What both projects have in common are the description of lives lived at an emotional fever-pitch. Amongst the musicians at the forefront of the first 1970s revivalist wave was the Canzoniere Grecanico Salentino (CGS). Co-founder Daniele Durante passed on the group's leadership to his son, Mauro Durante, in 2007, and Canzoniere is the fourth album made under his tenure. Mauro Durante has increasingly, and deftly, introduced world-music influences into the CGS sound. In a way, such 'outward-looking' additions are likely inevitable, given Puglia's proximity to other cultures and countries that have traversed the Mediterranean. Hence, 2013's Pizzica Indiavolata incorporated a dose of Malian sounds; Canzoniere brings in Turkish and bhangra touches. Further, there are many young pizzica-influenced groups that introduce an electronica component into the music; however, CGS has remained an acoustically-oriented band with a huge sound. Where Canzoniere makes its most dramatic statement is by taking southern Italian roots, and boldly going for a more overt pop mix. 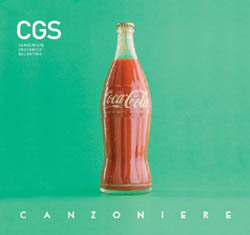 The mission statement is reflected in the album's artwork: a Coca-Cola bottle filled with tomato sauce; the global, taking in the local. Or perhaps, the local infecting the global: this is CGS's 'message in a bottle.' The band have worked with stellar musicians, including the composer Lucovico Einaudi, with whom Durante served as musical assistant for the La Notte della Taranta festival. Other collaborations followed with New York musicians who have worked with acts such as Sting, Steely Dan, Coldplay, David Bowie, and Diana Ross. The Canzoniere album itself was produced by Joe Mardin, son of the legendary producer Arif Mardin of Atlantic Records. All this might give the listener pause: would too many cooks spoil the uniqueness of the CGS? Would the band sound, basically, too commercial? In fact, for this listener, I found that the external help remained very respectful of CGS, and that the undercurrent of the pizzica is never far away on the album. Further, the lyrics of this album are far from typical mainstream fare. While the songs address love, the travails of life, and nature, the CGS write songs that are poetically rich in imagery and which explode with emotion.  and condemns the non-stop blather such as one might find on television or social media. What stands out, as sung by Alessia Tondo, is that special person around whom I start breathing/everything lights up here along with you. It's a frenetic opening track, which leads to the song Ientu, where wind and breath mix, and the tune is carried onwards by accordion and handclaps.  A dance-floor filler with a hugely singable chorus, this is modern pop meeting the south head-on. The song Moi introduces the persistent beat of the tambourine in the traditional pizzica style, and one has to marvel at the skill of this song that describes searching for one's music and human connections. The tambourines beat deep at the song's heart, essentially a beautiful pop song tinged with melancholy. The very traditional Pizzica De Sira follows, showing up the CGS roots; tambourines, accompanied by off-kilter accordion and fiddle, highlight the ritualistic healing power of the music. Aiora (The Swing) builds up a whirlwind of pizzica sound, starting out in bare-bones fashion, then leading to deep dives on the fiddle and string accompaniment as the tambourines beat out their hypnotic rhythm; the song is paradoxically fast-paced, a trance, and yet the pace is slow, dragging one under, while Alessia Tondo floats over the top. Subbra Sutta (Up Down) is a funk-driven workout, nodding towards bhangra music, impelling one to dance, scream, move, spin, jump; it is the Canzoniere Grecanico Salentino at their kinetic best. Fears of going crazy emerge on La Ballata Degli Specchi (The Ballad Of The Mirrors) and the band stretches out the beat to the point of it disappearing, leaving Durante's fiddle wailing, the thunder of the tamburello pointing to the climax. Intra La Danza (Get Into The Dance) is an odd choice for the close of the album (in the sense that, by this point, the listening and dancing audience has long surrendered to the beats of the recording), brings Canzoniere to an exciting conclusion by inciting people to dance and to heal this illness together, the pizzica motoring on in its insistent, persistent fashion. 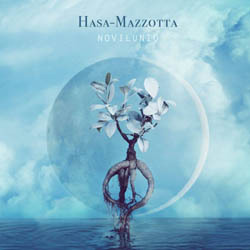 The Albanian cellist Redi Hasa and the Puglian vocalist Maria Mazzotta comprise the project Hasa-Mazzotta. The two musicians seek to explore connections between their musical traditions, and Hasa and Mazzotta do so in experimental ways. The core of their investigations are based around the deep, sonorous tones of Hasa's cello  the instrument that, for classical musicians, is most reminiscent of the human voice. Sometimes plucked like a guitar, at other times played with vigorous and subtle strokes, Hasa's cello is the perfect foil for Mazzotta's incredible voice. The overall effect is intimate, bridging folk, jazz, and even cabaret in a bewitching program. Capufrisca starts with percussion that is oddly reminiscent of a cheap electronic drum machine, but the effect is produced acoustically. Mehdi Nassouli lends his voice in Arabic, along with bendirr and tarr, and Hasa positively soars over a complex rhythm. The title track, Novilunio, is an erotically-charged song to love, and to the moon. Cu Ti Lu Dissi shows Mazzotta at an impassioned peak, her voice crying out and wavering, then swooning to Hasa's cello. It is a track that shows how emotionally naked and direct Hasa-Mazzotta work as a duo. The album contains two traditionally-based tracks  the Albanian 25 Trecce (25 Braids), and the Italian Libro D'Amore. Both are love songs. 25 Trecce is dark, glinting, and Mazzotta's voice builds with passion. Libro D'Amore is the longest track on the album, and it is a pizzica tune that starts out with Hasa once again plucking his cello and Mazzotta singing over some deep, swirling sonics. Mazzotta picks up her tambourine 1:47 into the drama, and the pulse drives the tune along. Hasa begins to solo, and the trance element becomes inescapable, intense, drifting out into great swells that cascade into squalls of cello feedback. © 2017 RootsWorld. No reproduction of any part of this page or its associated files is permitted without express written permission.